Gut health is determined not only by the amount of food we eat, but also features its assimilation. The most typical result of a sedentary lifestyle, stress and an unbalanced diet is constipation. This is extremely common and seemingly harmless disease that actually prevents the natural cleansing of the body and can lead to complications and the development of colitis, hemorrhoids and other diseases. According to some reports, constipation can accelerate the aging process. Sattva Suhdeta Capsules is a unique formula of natural plants, which, according to Ayurveda, have a safe history of their use in constipation. It relieves occasional constipation and helps maintain regular bowel movements. Sattva Suhdeta Capsules is a unique ayurvedic formula, It irritates the mucous membrane of the large intestine, causing intestinal peristaltic action thereby softening the stool and evacuating it. Laxatives plants in the formula initiate the cleansing of liver, helps to improve kidney function and are useful for nerves and respiratory system. Helps in the treatment of constipation, stimulates the intestine. Helps in the treatment of abdominal pain, flatulence, feeling of heaviness and nausea. Cleans and rejuvenates the body. Gently cleans and disinfects the digestive system while replenishing and nourishing it. Very useful for hyperlipidemia, balance cholesterol levels. Effectively removes stomach troubles and digestive disorders. Supports healthy digestion, absorption and gently support the regularity of the stool. Haritaki (Terminalia chebula) - tones the body, has an astringent and anthelmintic action. Strengthens the stomach, improves digestion, helps with hemorrhoids. It is an effective antiparasitic herb. It Eliminates vomiting, diarrhea, bloating. Normalizes the secretion of bile and improves digestion. Saunf (Foeniculum vulgare) - a plant rich in vitamins, minerals and micro elements. Used in motility disorders of the intestine, gastrointestinal tract disorders, during bloating and as a disinfectant and anti-inflammatory agent. Pomegranate (Punica granatum) - contains alkaloids, tannins, malic and citric acid, vitamin C, macro- and microelements. Used as an astringent for disorders of the gastrointestinal tract, as well as anthelmintic, dysentery, gastric diseases, avitaminosis. Rose petals (Rosa centifolia) - Creates a lasting effect on the normalization of bowel movements and helps digestion. Removes unpleasant effects such as constipation, acidity, loss of appetite and feeling of abdominal heaviness. This natural combination is particularly effective on the gastrointestinal tract for everyone including children, and has a strong anti-parasitic activity. 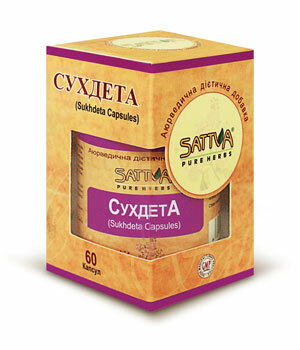 Sattva Suhdeta Capsules is very good for people with high mental stress, students, as it nourishes the cells of the cerebral cortex, relieves tension in the lining of the stomach and duodenum. Also, good results can be obtained when taking Sattva Suhdeta Capsules for people suffering from obesity and high cholesterol in the blood. Diet: The person using the product (for constipation) should organize their eating habits. Breakfast, lunch and dinner to be taken at the appropriate time. It will be helpful to drink plenty of fluids, milk and eat coarse food (salads, etc.). Products for use: light diet consisting of rice and a green soup. Drink plenty of water. Helpful cottage cheese and milk. Vegetables and fruit drink containing fibers, i.e. leafy vegetables, beans, etc. Foods to avoid: fried junk food, seafood, potatoes, bread, cheese, alcohol, candy, pasta, pastries, meat and acidic foods. Acidic foods should be limited. Haritaki (Terminalia chebula), Saunf (Foeniculum vulgare), Gulab(Rosa centifolia), Amalaki (Emblica officinalis), Ajwain (Carum copticum), Coriander (Coriandrum sativum), Lavang (Syzygium aromaticum), Aloe (Aloe barbadensis), Dadim twaq (Punica granatum), Parsik Yavani (Hyoscyamus niger). Take 2 capsules once a day with warm water before going to bed. Chronic constipation, flatulence, indigestion, disruption of the gastrointestinal tract, lipid metabolism, parasitic infestations, intestinal dysbiosis, gastritis with low acidity, high cholesterol, obesity, skin rashes, nervous exhaustion.